Martin Luther King, Jr. and President Lyndon B. Johnson. LBJ Library photo taken on 12/3/1963 by Yoichi Okamoto in the Oval Office at the White House, W28-12. Following the success of DTC’s 2016 production of All the Way, The Great Society continues the story of Lyndon B. Johnson’s turbulent presidency in the second part of Robert Schenkkan’s epic theatrical event. While the president fights a “war on poverty” at home, his war in Vietnam begins to spiral out of control. Besieged by political enemies, Johnson desperately fights to pass civil rights legislation and some of the most important social programs in American history, even as the country turns against him and descends into chaos. 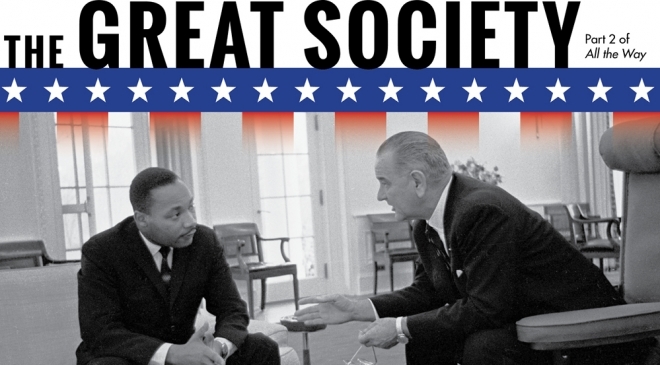 Filled with a cast of legendary characters – from Martin Luther King Jr. to Bobby Kennedy and Richard Nixon – The Great Society is an exhilarating examination of power, morality, and change. Contains mature themes, recommended for people High School age and up.